Inspired by the work she did on a disease whose victims rarely reach the age of 30, UP Manila-based clinical geneticist and National Institutes of Health Executive Director Eva Maria Cutiongco-de la Paz is using her knowledge of the Filipino’s genetic makeup to heal and manage serious birth defects and illnesses. And with the technology of a newly launched laboratory at the Philippine Genome Center behind her, this Dangal ng Bayan Awardee is ready to take the next step. 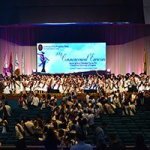 The University of the Philippines Manila, the nation’s Health Sciences Center, held its 109th Commencement Exercises at the Philippine International Convention Center on June 22, 2018. A total of 1,095 members of UP Manila Class of 2018 were conferred their titles and degrees. The National Institutes of Health (NIH) – University of the Philippines Manila, in celebration of its 20th anniversary, organized a scientific conference focusing on the importance of work, health, and well-being of the Filipino people. Attended by about 400 participants from colleges and universities, government and non-government organizations, and corporations, the conference was held on March 14 at the Bayanihan Center, UNILAB, Pasig City.